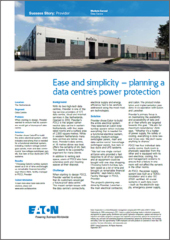 When starting to design, Previder wanted to ensure that its customers would get a future-proof data centre. Previder chose Eaton® to build the entire electrical system, which includes everything that is needed for a functional electrical system, including medium-voltage switchgear panels, main and data centre rooms’ low-voltage switchgear panels, bus bars or bus ducts and UPS systems. ”Choosing Eaton’s turnkey system saved us a lot of time and brought us remarkable financial benefits,” says Marco Alink, facility manager in PDC2, Previder. With its two high-tech data centres, Previder is one of the top service providers of ICT, data centre, cloud and internet services in the Netherlands. Opened in 2010, Previder’s PDC2 is the largest carrierneutral data centre in eastern Netherlands, with four separated rooms and a surface area of 2,500 square metres. While in western Netherlands many data centres are below sea level, Previder’s data centre, at 14 metres above sea level, offers the certainty of dry feet. This seems to be a powerful argument for many clients. In addition to renting rack space, users of PDC2 also have extensive work and meeting spaces at their disposal.